And it’s a history we should keep in mind as our leaders in Washington try to tackle the half a million or so immigrants, most of them Mexicans, who enter this country without authorization each year, swelling a population of about 11 million illegal residents. The House has already passed a get-tough bill that would fence off about a third of this country’s two-thousand-mile southern border, while the Senate is juggling proposals that range from the aggressive—our own John Cornyn and Arizona’s Jon Kyl want to hire 10,000 more Border Patrol agents and crack down on businesses that hire unauthorized workers—to the more lenient and broadly supported “guest worker” plan sponsored by Senators Ted Kennedy and John McCain. President Bush also has a plan, similar to Kennedy-McCain, allowing hundreds of thousands of Mexican workers to enter each year on temporary visas. But if we’re waiting for a political solution, history isn’t on our side. It’s not just that the president’s guest-worker proposal has angered hard-liners in his own party; it’s that whatever we end up with—if anything—will come with a track record of failure. The guest-worker plans are remarkably similar in most features to the Bracero program that began with World War II manpower shortages and was junked more than forty years ago. Though it provided legal entry for hundreds of thousands of temporary farmworkers annually, the Bracero program only contributed to a flood of illegal workers, in large part because Texas growers balked at the 30-cent-an-hour Bracero wage. In 1952 Congress rewarded the scofflaws with the “Texas proviso,” which shielded employers of illegal immigrants from criminal penalties. 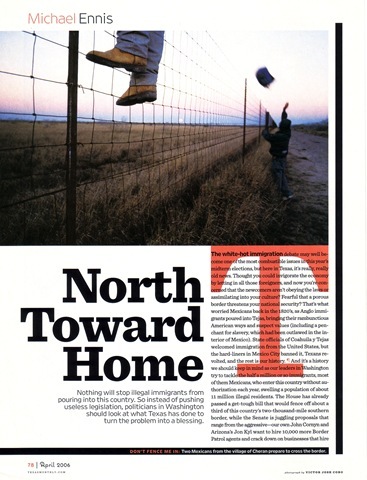 The Reagan administration’s 1986 version of “comprehensive” immigration reform called for beefed-up border security and an end to the Texas proviso, imposing fines on employers of unauthorized workers. As a result, the number of Border Patrol agents has been tripled over the past two decades, with absolutely no effect. And those employer sanctions? They’re a mirage. In 2004 exactly three U.S. companies were threatened with fines for hiring unauthorized workers. The plans now on the table simply promise that Washington will repackage the same old policies and make sure that they fail again. There’s a reason why immigration policy never works: It’s hard to find solutions when we aren’t, as a nation, sure about the problem. While polls show an increasing conviction among the public that immigrants, both legal and illegal, hurt the economy, there is broad disagreement among economists over the real impact of even the large number of low-skilled, poorly educated illegal immigrants. If there’s a consensus, it’s that illegal immigrants take a single-digit percentage of the jobs that might otherwise go to native-born high school dropouts, while also marginally depressing wages among the same group—a problem that might be better addressed by making sure that more native-born kids finish high school. On the other hand, recently retired Federal Reserve chairman Alan Greenspan observed that our large immigrant workforce has played an essential role in restraining inflation, by lowering the costs of basic goods and services, which itself cushions the shock to low-income Americans. That illegal immigrants are a net burden on the welfare system is also a popular belief, but the 1996 welfare reform bill excluded even legal immigrants from most federal assistance. Illegal immigrants pay billions each year in Social Security taxes for which they receive no benefits, and we often overlook the state and local sales taxes, fees, and property taxes (in the form of rent) they also pay. Many economists now forecast that in the long run, all those immigrants will compensate for the declining birthrate among the rest of us, not only taking up the slack as baby boomers retire but also playing an essential role in funding boomers’ Social Security benefits. But even if we did the math, we’d still have an immigration debate. That’s because it really isn’t the economy, stupid; it’s about the culture. After September 11, border security became a national issue. Of the more than 100,000 OTMs (“other than Mexicans”) who were caught crossing over with the rest of the undocumented traffic last year, some were from terror-sponsoring states. But the most thoughtful hard-liners, like Cornyn, believe the answer is mobile, high-tech law enforcement and actually detaining the OTMs we already catch, not the House’s feel-good but easily outflanked Maginot Line. Local law-and-order issues ranging from uninsured drivers to the rampant trade in forged Social Security cards also contribute to what conservative columnist David Brooks recently characterized as a “subculture of criminality.” But according to Social Security Administration records, hundreds of thousands of American employers have been only too happy to hire workers with patently phony cards, and our suburbs are full of law-abiding citizens who don’t even bother to inquire about the documentation of their housekeepers, gardeners, or, increasingly, the skilled tradesmen who build and repair their houses. That criminal subculture includes an awful lot of us. The crime many people are really worried about is national identity theft. We might be a nation of immigrants, but we’ve always had a last-one-in-bar-the-door attitude about the next immigrant wave. Even before we became a nation, it was the Germans who threatened to overwhelm the English-speaking colonists, as Pennsylvania’s Benjamin Franklin noted in 1750: “This will in a few Years become a German Colony: Instead of their Learning our Language, we must learn their’s, or live as in a foreign Country.” Throughout much of the nineteenth century, nativists feared that Irish and Italian Catholics would subvert democracy and surrender the republic to the pope, a fear that dogged John F. Kennedy’s presidential campaign, in 1960. Today’s chimera is the Latino laborer hunkered down in his Spanish-only enclave, his children coddled in bilingual public schools, patiently waiting for the restoration of Mexico’s pre-1848 borders. It’s a fear played out against a very real demographic revolution: Hispanics became the nation’s largest minority three years ago and are projected to be a quarter of the U.S. population by 2050. Academics like Hoover Institution Fellow Victor Davis Hanson (Mexifornia: A State of Becoming) and Harvard professor Samuel P. Huntington (Who Are We? The Challenges to America’s National Identity) argue that America’s cultural integrity and Anglo-Protestant values are under broad assault by Latino immigrants who, they say, refuse to assimilate, retaining their allegiance to Mexico and its culture. Voters in California and Arizona have fought back with referendums mandating “English immersion” as an alternative to bilingual instruction; other popular weapons are measures to bar immigrants from state aid and vouchers primarily intended to rescue Anglo kids from heavily Hispanic public schools. But the funny thing is, the state that occupies half of the two-thousand-mile front line in this clash of civilizations—and is projected to have a Latino majority no later than 2035— has resisted the temptation to go nativist. California voters scrapped bilingual classes eight years ago, while in Texas, where the passage of state-mandated bilingual education in 1973 was a watershed for long-neglected Hispanic kids, there has yet to be a concerted campaign for the English-only approach. 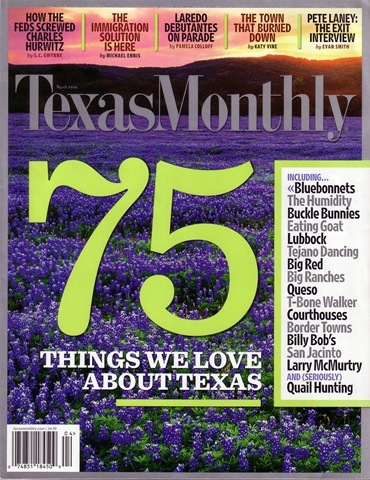 No one would suggest that we Texans are all that welcoming when we feel our values are threatened; we’re the state whose governor recently warned gay American veterans that they’d be better off locating elsewhere. But Texas is so hospitable to immigrants that we’re one of only eight states to offer in-state college tuition rates to undocumented students. As surprising as our immigrant-friendliness may be to many, it speaks to who we are. To be a Texan is to inhabit a vast bicultural frontera, one that extends far beyond the Rio Grande and is far more profound than popular expressions like Tex-Mex cuisine and conjunto music. Not so much a boundary as it is the absence of one, that frontera has made us hemispheric citizens, plugged into a culture older, more complex, yet more distinctly American than that of Puritan New England or the Anglo-Protestant South. We’re part of the original America, the new world named after a Florentine explorer, Amerigo Vespucci, an America shaped when the rapidly modernizing culture of Renaissance Europe collided with the sophisticated ancient empires of the Western Hemisphere, powerful indigenous cultures that still live on in the language, religion, and art of the campesinos who make up a large portion of our most recent arrivals. One artifact of that enduring hybrid culture is that shrine of everything Texan (and American), the Alamo; its eighteenth-century facade combines Spanish baroque architecture with an Aztec-influenced ornamental style introduced by mestizo stonecutters. Our relationship with this culture has always been as complicated as it is passionate. As Texans, we’ve fought two wars with Mexico, in the 1830’s and 1840’s, and a third, undeclared border war in the early twentieth century, a conflict that saw the Texas Rangers commit brutal atrocities against innocent Tejanos. Texas historians like Walter Prescott Webb often saw the border as a sharp dividing line in a Manichaean struggle between barbarism and civilization. But when Texas artists and writers started defining a uniquely Texan culture back in the twenties and thirties, they immersed themselves in the culture of Mexico, mining its architecture and folk art and studying at the feet of the Mexican muralists; it’s no accident that J. Frank Dobie’s 1929 Texas literary landmark was titled A Vaquero of the Brush Country, not A Cowboy of the Brush Country. Today the University of Texas at Austin turns out more graduate and postgraduate degrees in Latin American studies than any U.S. university; it was UT scholars who cracked the code that enables us to read ancient Mayan hieroglyphs, opening the book on the epic history of the New World’s old world. From think tanks to our major art museums, today we have a panoply of institutions that have already made Texas an important player in a truly hemispheric American culture. Not only does that intellectual capital promise to continue our cultural enrichment, but as free trade sweeps the Americas, it also promises to make us rich. Our nation’s exports to Latin America, the majority of them to Mexico, are already almost equal to our exports to the European Union, despite our having neglected our hemispheric partners as we focus on the Middle East. (Just six days before September 11, President Bush declared that “the United States has no more important relationship in the world than the one we have with Mexico.”) Amid a rancorous national immigration debate that will have little practical result, Texans can profit by tuning out the boneheads in California, Arizona, or that great border state of Colorado, where Congressman Tom Tancredo has emerged as the nation’s fence builder. We’ve been in the middle of this collision of cultures a lot longer than they have, and we’ve learned enough to tell the rest of the country the truth about the other side: They will become us, and we are already them.